To make the biscuit base, place the biscuits in a food processor and process until the mixture resembles coarse breadcrumbs. Add the butter and process until combined. Using the back of a spoon, press the mixture into the base and sides of a lightly greased 24cm loose-bottomed and deep-fluted tart tin. Refrigerate for 1 hour or until firm. Place the cream cheese in a food processor and process for 1 minute or until softened. Add the sour cream, vanilla and sugar and process, scraping down the sides of the bowl, for 1–2 minutes or until thickened. Place the mixture in a large bowl and whisk in the cream until stiff peaks form. Spread 1½ cups of the cream mixture evenly over the biscuit base. Top with a layer of biscuits and spread with 1 cup cream mixture. Repeat with the remaining biscuits and cream mixture to create 2 more layers, pressing down after each layer and finishing with a layer of the cream mixture. Refrigerate for 4 hours or until set. 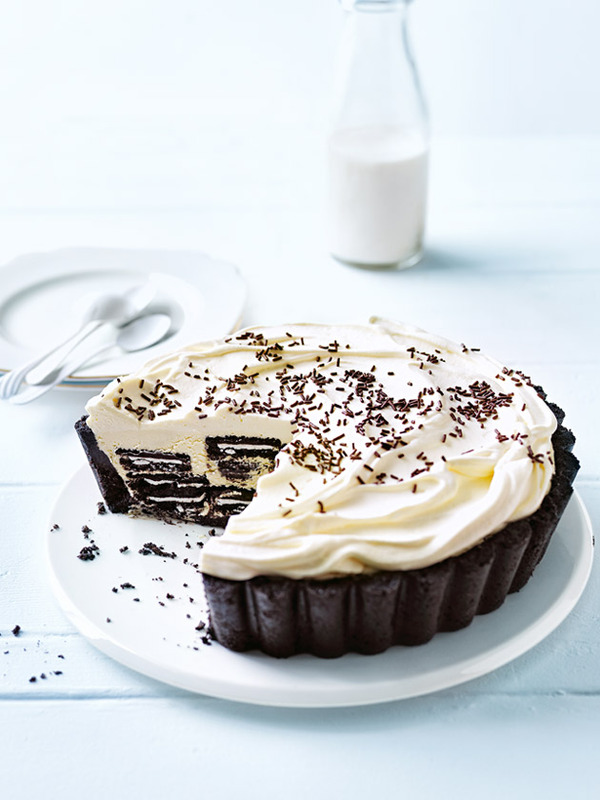 Remove the pie carefully from the tin and top with chocolate sprinkles to serve. Serves 10–12.